Ancient Egyptians produced glass for the pharaohs. Roman artisans in the first century AD developed (through undercutting) such masterpieces of cameo work as the famous Portland Vase. Venetian glass of the Renaissance remains a benchmark in th ehistory of this delicate, brilliant man-made product. The flowering of the brilliant colors and designs of art glass during the late 1800s must stand as another high mark in the history of art glass. France led in producing beautifully patterned cameo glass; Thomas Webb & Co. of England made both cameo and other high quality products; but it was in America that new styles and shades of art glass dominated the field. The Great Exhibition of 1851 in London provided the impetus fro many new innovations in the decorative arts. Victorian ideas of ‘good taste’ were changing, and manufacturers were rushing to satisfy these new desires. 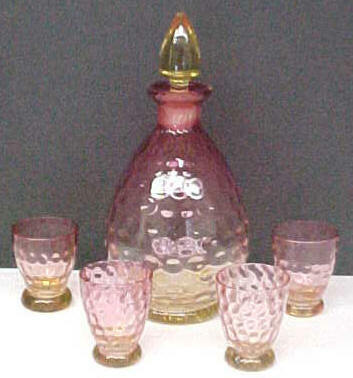 In the forefront of the American glass companies were the New England Glass Works, Mount Washington Glass Co., and Hobbs, Brockunier & Co (Wheeling). Libbey and Dorflinger also became known for brilliant cut glass. Mercury glass, an imitation of silver, was the first of the new types of glass produced. The glass was free blown, then tooled into double walled form, with mercury poured between the walls and a cork inserted to protect the mercury from air. Mercury glass has its enthusiastic collectors, yet prices for pieces in good condition remain surprisingly modest. In the 1880s, American glass manufacturers began experiments with heat sensitive glass that could be reshaded by reheating certain portions. Much of this glass contained gold, making it expensive to produce, and genuine Victorian examples command premium prices today. 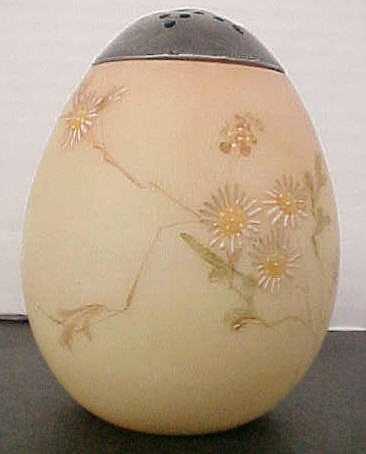 Peachblow, made to resemble the colors of Chinese Peachbloom porcelain, was produced by several glass houses in the 1880s, each with slight variation. Wild Rose is the name that New England Glass gave to its peachblow, which turns shades from pink to cool white. Mt. Washington glass turns from peach to ivory. Wheeling produced cased peachblow, transparent glass with an opaque white lining. Amberina, another coveted color, is amber glass that has been reheated to develop a red color on only one part of the glass. American examples seldom have decoration; floral designs are found mainly on Bohemian and English copies. 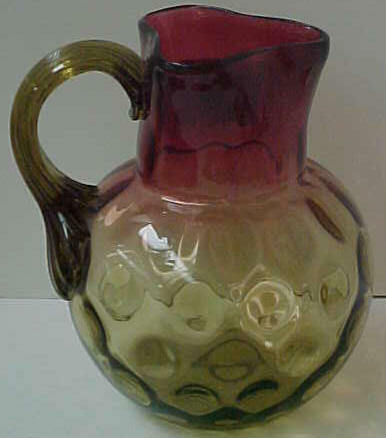 A further development is Agata, which added a mottled blackish stain to give the glass and agelike mottled surface. Most agata pieces are small, and examples are rare. 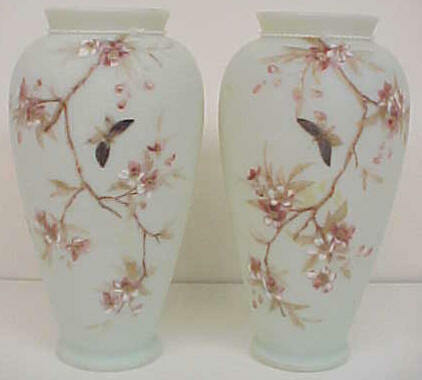 Other designs imitated delicate porcelain. Mt. Washington’s Crown Milano is an opal glass, free blown of pattern molded glass, tinted a delicate color and decorated with enameling and gilt. The rare and beautiful Royal Flemish line created a stained glass effect; the surface was divided with raised gold lines and sections filled with transparent colors and decorated in gold enamel.